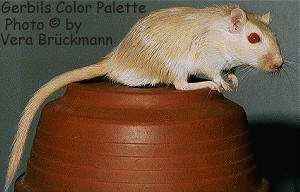 The Gerbils Color Palette Loading the photos will take a few minutes. Please don't become impatient... ;-) Problems? There is a mirror site in Poland available! And this page is also in German language available! If you would like to compare different colours: There is a split view with frames. BTW: It works with the other linked Gerbilpages too. = Get back again to this palette by clicking any of the little palette icons (in front of each horizontal rule)! 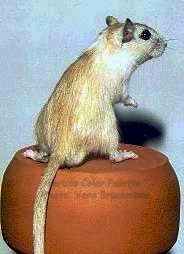 Lew Stead's gerbil page, Karin van Veen's Gerbil Information Page and Elizabeth Heckert's Dani-Clan and you can compare it with the show standards of the National Gerbil Society, the genelist and the scientific literature there, too! 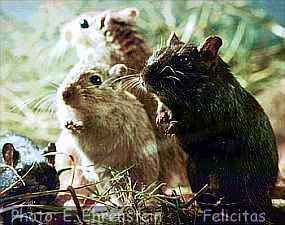 The international forum of the most engaged gerbil breeders is "The Gerbil Mailing List". 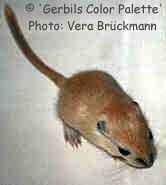 Some more genetic links with nice gerbil color pages also in the German version. Notice: Some of the genecodes aren't confirmed yet. If there is a question mark, further investigations are needed. Such genecodes are shown for discussion purpose only! On the Photo Eva's gerbil called "Frosch" ;-). This one has an atypical light colour, but so it becomes obvious, that there is some variation in the wild color, too. The color of some Agoutis tends to more grey, of others it can be more intensive often with a little higher amounts of red. 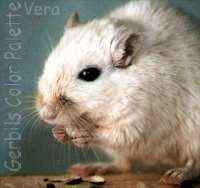 Please compare it with Vera's gerbil in front of a Skinner-Box on the "Gerbil behaviour" page. The main effect of the pp-gene is lightening of all parts containing the black pigment (Eumelanin), so no black ticking at the end of the hairs is visible and it leads also to a rubin eye colour. 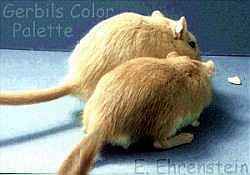 The intensive colour is due to the yellow, not grey, colour of the hair-base in all gerbils with the ee gene. Notice: A younger Algerian (photos above) shows a beginning ticking at the forehead. Below an old dark eyed honey with finished ticking, so it appears darker. 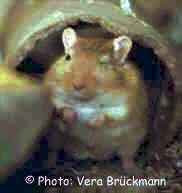 Differences to Agouti: The white eye circle and white "line" from the white belly up to the ear is more pronounced in DEH/Algerian than in normal Agoutis. 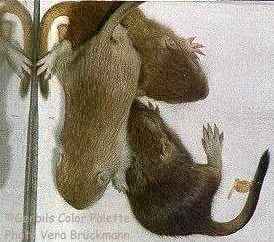 So, their white belly ends higher towards the shoulder than agouti bellies. And ticking isn't as pronounced as in agoutis, so DEH appear more orangy. (Thanks to Nienke Wijnants and Elizabeth Heckert, which point to me this differences). there is some evidence, that Sp has a strong lightening effect in the Algerian unusual to normal spot, which might indicate an interaction between ee and Sp(?). 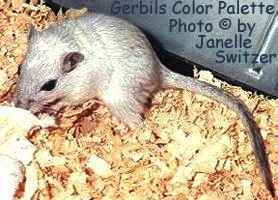 I'm not sure if the Photo of Janelle's gerbil called "Pheonix" might be such a spotted DEH or something else? Vera means, its more likely a spotted Nutmeg, because it is too dark. notice: The difference to the Argente Golden (see above) isn't very obvious. If you blow the hairs aside, you can see a yellow undercoat in the foxes (ee), whereas it is (normally) grey in colors without the ee genes. 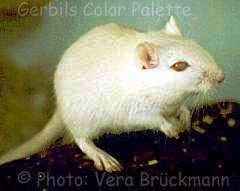 Notice: Ticking becomes more pronounced in older Polar Fox gerbils. Under some light conditions, the retina of all P-gg seems to be of wine-red color as shown on the photo of the younger Polar Fox (in the middle), but the difference to normal dark eyes is hardly to recognize. You can see a young polar fox in comparision with a young blue fox later on this page. Many good photos are on Joerg Eberbecks album page "Polar Fox". Later on - as on the photo here - nearly no difference to (ivory)-cream is visible (on the photo with the german name "Elfenbein"). Caused by the aa gene. Normally with coloured belly and with one-coloured hairs. 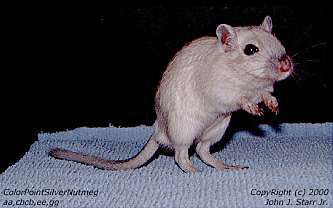 Notice: Self-colored gerbils with extended white areas caused by the dominant spotting gene (Sp) sometimes has a white belly. The same white spot is sometimes abbreviated with W+ and probably there are additional subordinated "pied" genes involved, when the spot area is widely spread on the body. 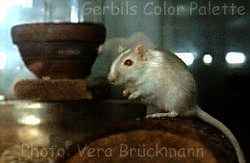 Please compare the different examples on this page and see Julians page with pied and patched gerbils. Many good Photos are on Joerg Eberbecks Albumpage "Black gerbils". 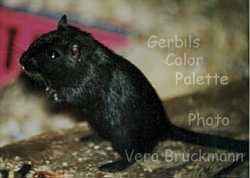 The photo shows a black gerbil with very extended spot areas. So it is called Pied Black too. 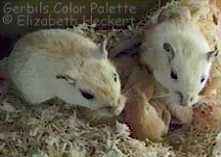 Breeders can select for more pied gerbils, so under the control of Sp additional subordinated (poly- or modifying-) genes are postulated, to explain this variation. 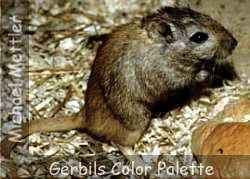 This new gerbil colour is probably caused by a further "dilution" gene called "dd", which is already known in some other rodent species. This colour mutation was discovered in 1998 at the Osnabrueck university in Germany. The coat colour is a metal-bluish black, the eyes and nails are black too. Of course, the graphic here is only a product of my phantasy ;-))! 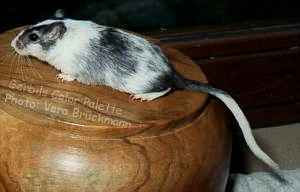 Please look at the GIP for the first photos of true "Blue" gerbils. 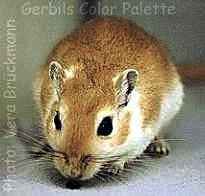 Probably other gerbil colour variants will be diluted to some extent too. Recently, Vera has already had success in breeding with the new dd-gene. 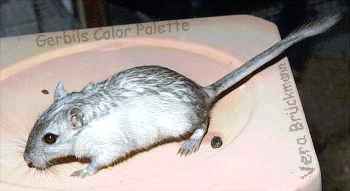 Look for Photos of the first offspring under the Color names [dd]-Grey-Agouti and [dd]-Agouti. The color is a dull charcoal black. Here on the picture an old one, already with some grey hairs. Notice: On the lower photo you can see a Dove (Silver) in the background. Notice: Because pp has a diminishing influence mainly on the dark Pigment Eumelanin, the lightening interaction of ch with pp becomes much more obvious between Lilac and Dove, as compared with the difference between the Argente Golden and Argente Cream (see above), which are coloured by the yellow Phaeomelanin-pigment. Half between Lilac and Dove is Sapphire (due to a similar lightening interaction of cchm with pp). Notice: On the second photo you can see an animal (on the right side) which looks like Ivory Cream. Due to the genotypes of its parents aaPpGgCCEef x aappGgCCEef) it must be something different. It is possible, that the Schimmel ef gene is involved. Compare it with Red Eyed Polar Fox, too. Nutmegs have a yellow undercoat, because of the ee, but a very long dark End of the hair (because of the aa), which dominates the visible impression. 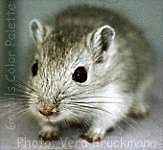 Ticking (= the tips of the hairs become dark or black) always becomes more pronounced in older gerbils. So, the yellow undercoat in young Nutmegs shimmers through more and they appear lighter. There is a great variability, too. On the second pic from Elizabeth Heckert, you can see an about 8 weeks old half molted nutmeg. The rear half of the body is still without ticking, but the area with new dark fur will proceed to the end in the next few weeks. 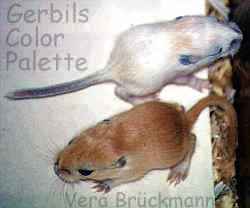 All gerbils change the fur ("moult") for the first time at this age (between ~8 to ~12 weeks), but in most colors, the difference isn't as obvious as in nutmegs. In other colors, sometimes a slight two tone effect or a clear line is visible between the old and new coat. As you can see, a spotted Nutmeg is (beside the white spot areas) obviously lighter on the whole body too! So there seems to be a additional sort of lightening interaction between ee and the Sp. On the left side you can see a Yellow Fox (with a white belly!). Please compare it with the Argente Golden above. Only little difference to Argente Nutmeg. 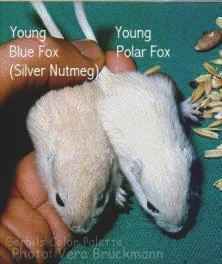 Typical for the Foxes (or Nutmegs) the young Blue Fox on the left doesn't have ticking, whereas it becomes very determinative in the older one (the second Photo). Notice: There is only a suggestion to postulate a new ef gene at the ee location. Further investigations are needed! Notice: The 'f' in ef means, the color "fades out" with increasing age, but especially the tail of the old Schimmel (below) remains still orange and near the nose you can see little remainders of the orange colour too. 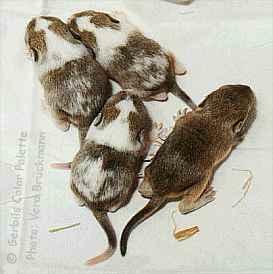 On the neck of the three weeks old spotted Schimmel (above), you still can recognize a few remainders of the orange colour, whereas the Schimmel is intensive coloured. Later on, colour fades totally in the spotted Schimmel (second Photo on the left side, on the right side, it's the just fading unspotted Schimmel). Notice: The typical ruby-red eyes of all pp-types. 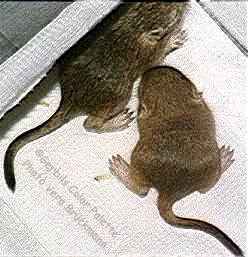 The younger resembles creme agoutis, but as like as Schimmel's the red-eyed Schimmel's fade out, too, when they become older. 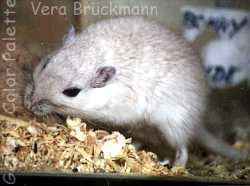 Reference: Petrij F, van Veen K, Mettler M, and Brückmann V. (2001): "A second acromelanistic allelomorph at the albino locus of the Mongolian gerbil (Meriones unguiculatus)". Journal of Heredity, 92(1), 74-78. The appearance of the Topas (above) is a little bit paler than the Argente Golden (below). But as a typical sign of the colorpoints, the region around the nose of the Topas is obviously darker than the body. Please compare it with the similar Argente Cream too. Both colours are hardly to distinguish. 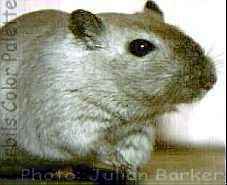 The Photo of Janelle's gerbil called "Abbey" might be a Light Colourpoint Grey Agouti, but she isn't quite sure. 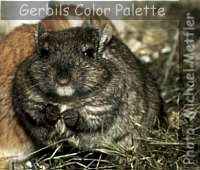 Notice: You can understand this new color as a black gerbil with a lightened body, only the extremities remain nearly black. The lightening effect of the Colourpoint gene varies to some extend. So, sometimes, you will see lighter, sometimes darker colored Burmese's. 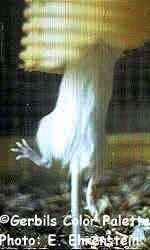 Some breeders believe, there might be a so called "UD"-gene (a modifying(?) UltraDark-gene) involved, too, when Burmeses and Siameses are obvious darker. 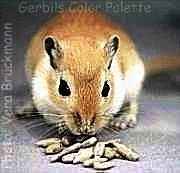 Please compare it with some UD-photos, you can find at Kelly Christenson's gerbil pages. Look at Joerg Eberbecks very good Burmese photos, too. aa cchmch E- G- P.
Siamese is a Colourpoint black, which is additionally lightened by the Himalayan gene ch. 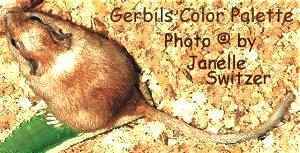 ©: We have got the two lower photos from Julian and Jackie from the National Gerbil Society, Thx! 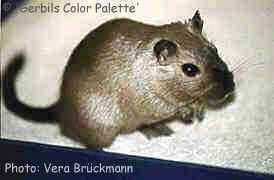 Notice: Vera's very young siamese gerbils (above) don't have the characteristic dark nose yet (what you see is only a shadow on the photo), but the tail is already dark. In older Siameses the dark nose is very obvious. The appearance is half between Lilac and Dove. Elizabeth has a nice page with more pictures of her "Lilith"
Notice: You can get lively cheerful depth photos with indirect back light ("contre jour") and the choosen background harmonize very good together with this little Lilith. We have thankfully gotten this Photo from John Starr. Look at his "The Ridge Road Gang"- Website. 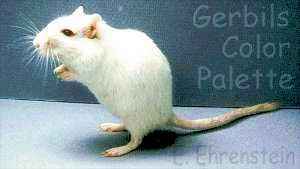 You see, with the new Colourpoint-gene cchm, there are many new combinations with other genes possible -- with the Agouti gene too --. 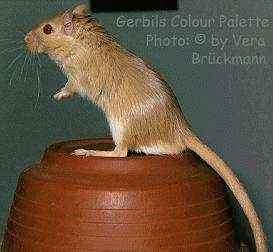 Perhaps you can find some more photos of these new colours on the Gerbil Information Page from Karin van Veen. 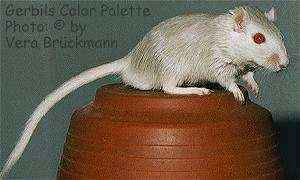 The ch gene removes nearly all colour pigments (in the fur and in the eyes too), but it isn't causing an absolute true "Albino", because the tail still can be coloured to a more or less extent. 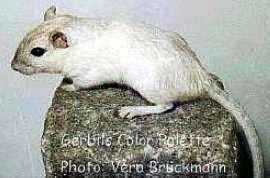 This sort of acromelanic albinism is called "Himalayan Albinism" by scientists. Both, the Himalayan ch and the Colourpoint cchm are located at the same gene location and both are acting the same way, too, but ch is much more effective in bleaching all of the coat colour of the body. OTHER THEN MERIONES UNGUICULATUS ? "Good morning! ;-)" "The strong attraction of tubes"
© 1996-1999 by Vera Brückmann (member of the "Gerbil Genetics Group") and Ehrenfried Ehrenstein. All parts, especially all photos on this page, are protected by copyright! 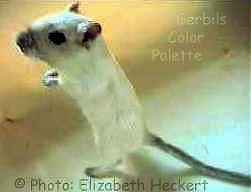 Gerbil Genetics Calculator A nifty and easy to use downloadable program to figure out which colors you can expect in the offspring. Just put in the genotypes of the two parents and voila! (win95 Version, sorry, no mac's!). Elli's Online Gene-Predictor works platform-independent with a CGI-form. 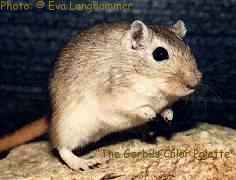 Gerbil and Jird Ring . 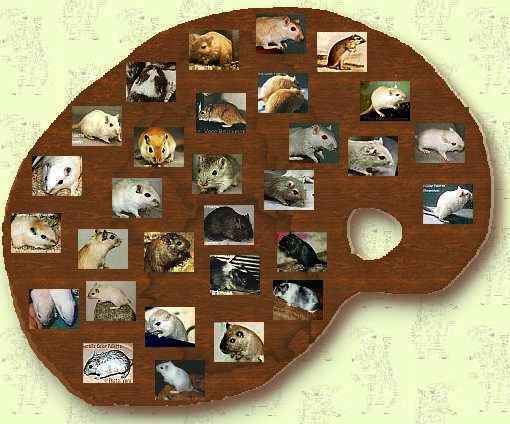 Do you own a Gerbil or Jird page? Join this ring! Do you own a Rodent page? Join this ring!